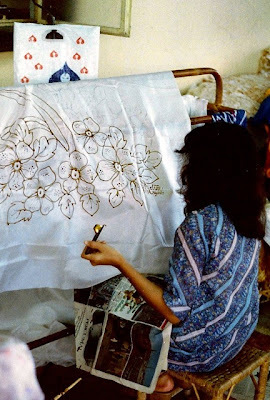 The woman, pictured above, is painting on the fabric with hot wax, a process called batik painting. The wax prevents the color from adhering to the area in the dyeing process, and the original color will show when the wax is removed. Today, quilters like to use batiks in their quilts, but that fabric and process is much different from these paintings, which were made of silk. Once the outline of wax is on the fabric, the dyes are added, also by hand. The wax is melted sometime during the process and the design remains. You can find some examples of silk, batik paintings here. Batik blocks are used mostly on yardage. The blocks are dipped in hot wax, again by hand, and then applied to the fabric in a repetitious manner. The fabric is then dyed. After the final dyeing, the wax is removed from the fabric. 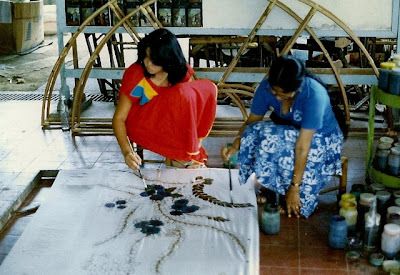 I am sure that today's commercial batiks do not have the wax applied by hand, but the process is the same. 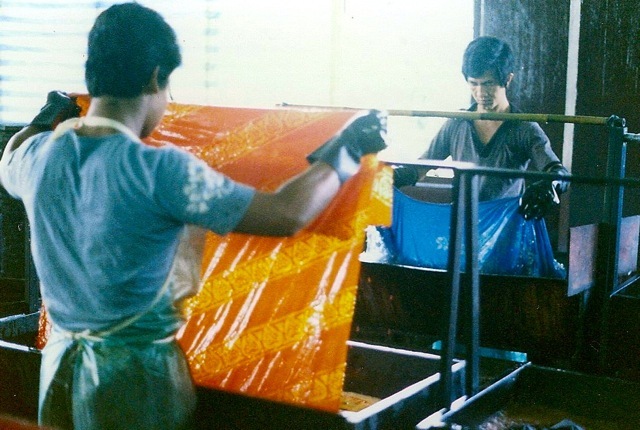 Bonnie Hunter visited a Batik factory while visiting Bali and wrote about it in three parts: part one and part two and part three. Bonnie also took a class in creating batik fabric. 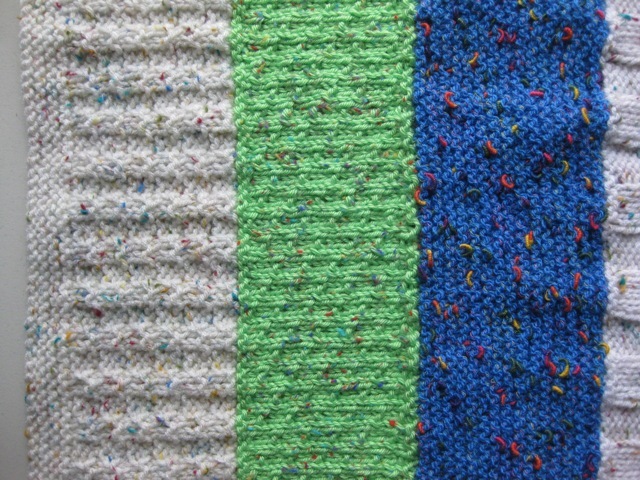 The last Oddball blanket for 2010 is appropriately called, Confetti. 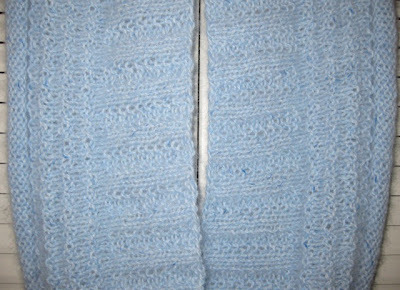 Each section is knit with flecked yarns. 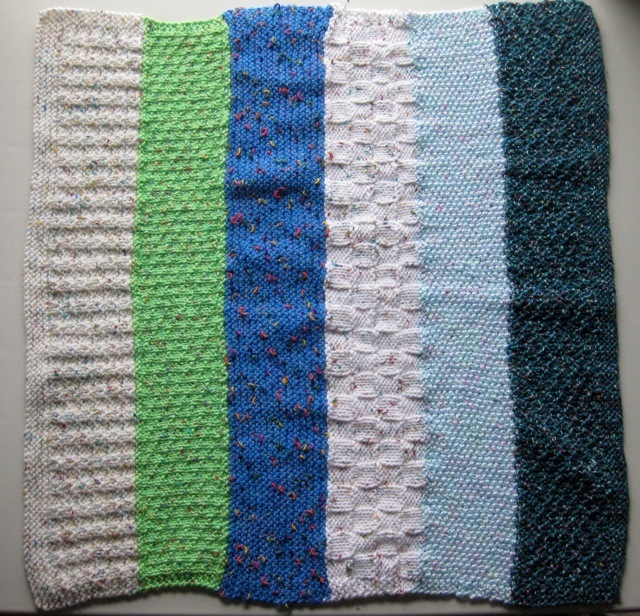 When I signed up for this blanket, I did not realize how difficult it would be to find a flecked yarn in my area. I found a lot of tweed yarns in dark colors, but nothing that would be appropriate for a baby blanket. I settled for white with multi-colored flecks, but I had hoped to find a blue so the blanket would look more complete. The blanket was knit on size 9 needles, and my stitch is Checks and Ridges. 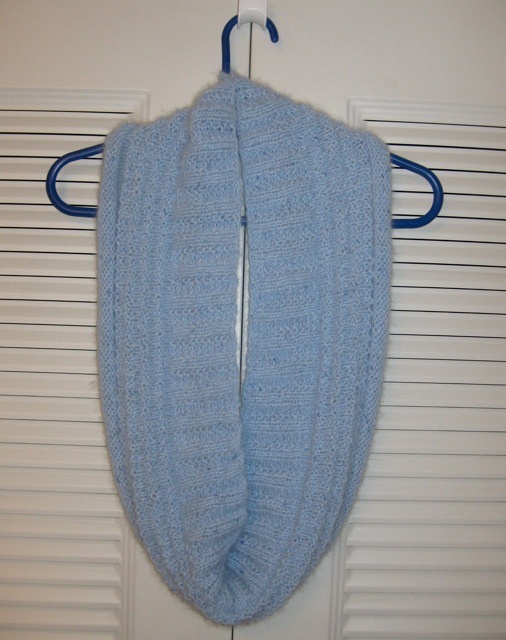 I liked the Eternity Scarf so much that I made one for myself, too. With the remaining yarn, I'm knitting a pair of mittens. Leave a comment on Monday's post for a chance to win an Eternity Scarf of your own. In recent weeks, some knitting blogs I follow have featured the Eternity Scarf, pattern available on Ravelry. I finally gave into the urge and purchased the pattern ($4.00) and was pleased with how quickly it was to knit. 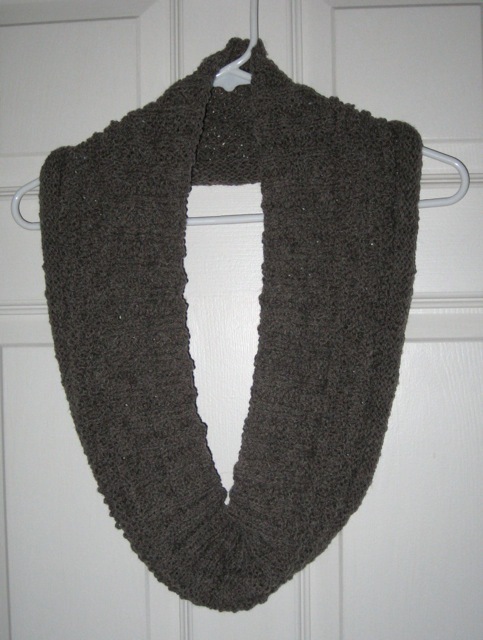 The above scarf used approximately 80 grams of Angora, Lambswool, Acrylic, and Nylon yarn on size 9 needles. 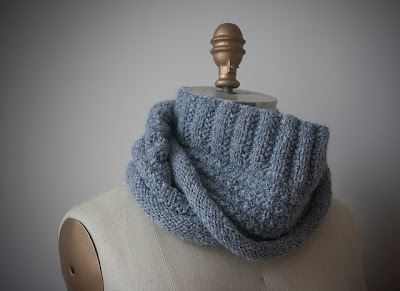 I like the versatility of this scarf, which can be worn several different ways, all shown on the Ravelry pattern page, link under photo. 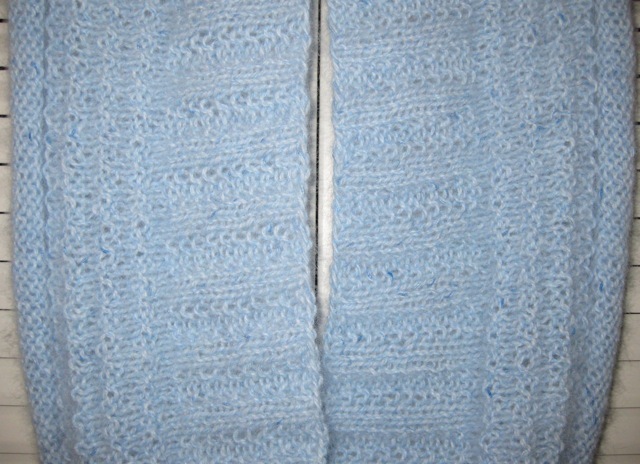 I am offering the scarf shown in the top two photos to one of my readers. 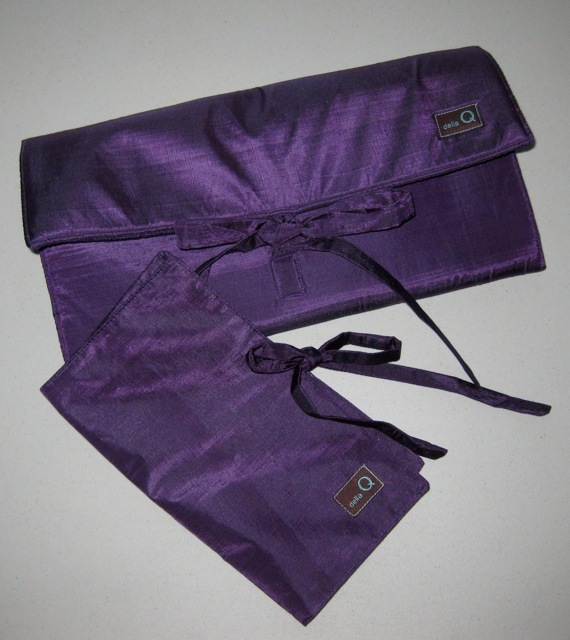 If you win and live in a warm climate, you are welcome to give it to a friend or relative in a colder one. Before December 31, 2010, leave a comment on this post about a project you want to work on next year. Winner will be announced on January 3, 2011. If you want to share a a project but aren't interested in winning the scarf, just note that on your comment and I won't include your name in the drawing. 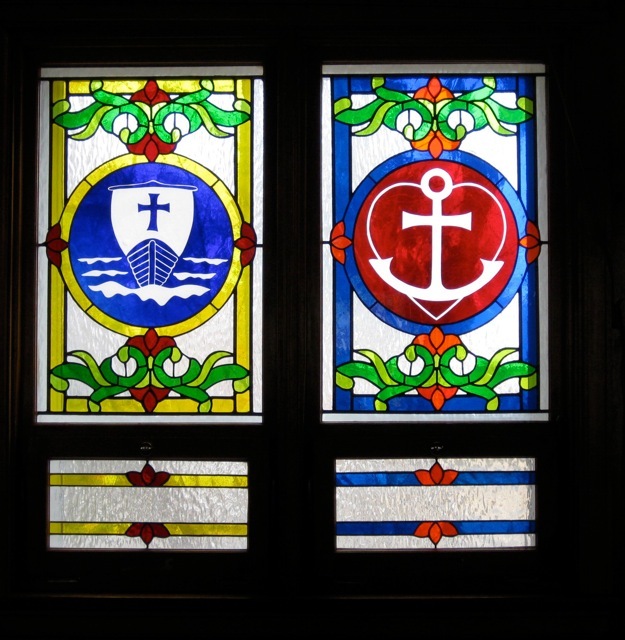 I've admired the windows in my church for years and decided to share them with my readers on Sunday. Each Sunday I will feature two stained-glass windows along with an explanation of each window. Previous windows can be viewed by typing "Windows of Faith" in the search box in the top left corner. The main body of the church building, lying between the entrance and church is called the nave, the part we sit in. This is a very interesting term derived from the Latin word "navis," meaning ship. In the early days, the Church, symbolically speaking, was the ark or ship of the Lord, the ship in which Christians sailed the sea of life. So the ship has long served as a symbol of the Church. By the grace of God, members of the Holy Christian Church, are passengers, who should not fear the storms and waves which from time to time rock the ship. With Christ as our Head, our Captain, we can say with Paul - "If God be for us, who can be against us?" The symbol of an anchor is one of the earliest Christian symbols. It was a symbol that frequently appeared in the catacombs and is based upon the Word of God recorded in the Book of Hebrews 6:18-19. "That by two immutable things, in which it was impossible for God to lie, we might have strong consolation, who have fled for refuge to lay hold upon the hope sat before us; which hope we have as an anchor of the soul, both sure and steadfast. . ."
The symbol of an anchor at times also takes the form of a cross, thus symbolizing both hope in the life eternal and salvation from sin through the merits of the Savior's death and glorious resurrection. A familiar combination of emblems is a cross, an anchor, and a heart; thus, signifying faith, hope, and love. God, in this Christmas season, deepen our understanding and appreciation for what You have done for us by sending your Son in human form to share in our humanity. In the days and months to come, help us to follow Him, to love Him, to serve Him. Amen. December 1979, a large group of teachers on the base took an organized tour of Southeast Asia over Christmas break. The day after we arrived in Hong Kong nearly everyone in the group became very ill, and the hotel doctor ordered bed rest. Since I was not ill, I wandered around snapping photos and rode the ferry to the other side of the harbor. Despite the mass of people on the streets, I felt safe. I am sure our group would have seen more of Hong Kong if the "bug" had not grounded so many. 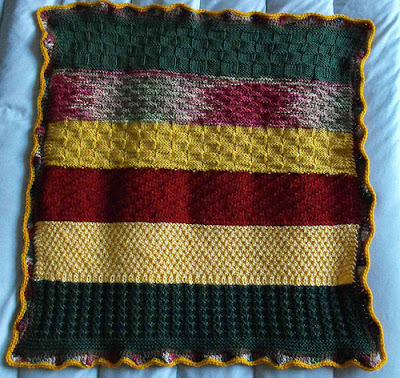 Falling Colors, a West Coast Oddball blanket, arrived in the mail on Tuesday. 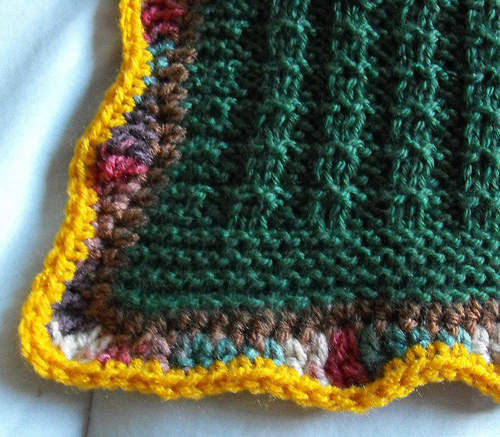 I added the green section at the bottom of the photo (Simply Soft, Dark Sage) and bound off. I'll start another blanket on the empty size 9 needles. I think Falling Colors is one of the most attractive Oddball blankets the group has done. When the border is added, it will be even better. 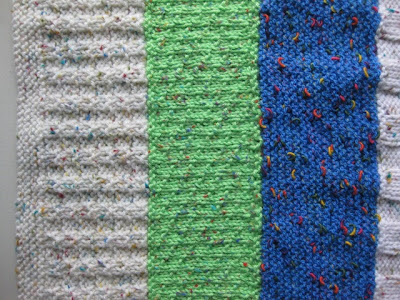 Update: January 2, 2011 -- A border has been added by a Ravelry member. Thanks, Kae. I've had my eye on the della Que-i case for some time and decided to order it as a Santa gift to myself. 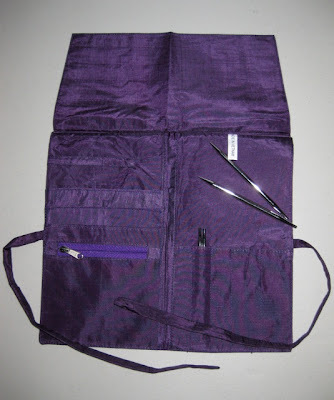 I have a binder for the needles, but it is bulky and awkward in my knitting bag. I love the portability of the Que-i. My Knit Picks interchangeable needles fit nicely in size-labeled pockets, and the cables slip into the individual pockets below. 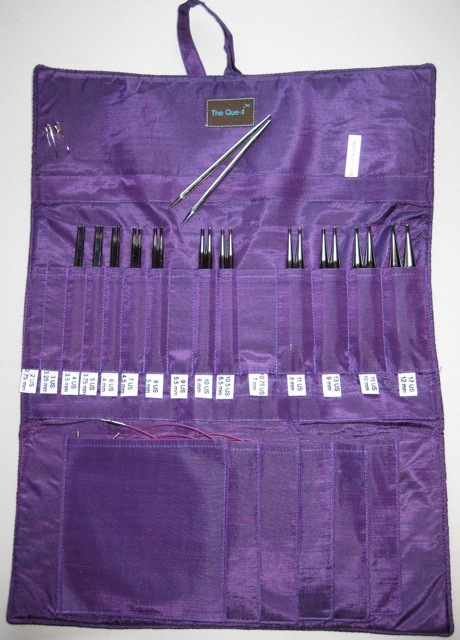 Della Q also makes a double case that holds two sets of interchangeable needles. Santa was a generous guy and also included a della Q Travel needle case for small projects. I must leave him some extra chocolate by the tree this year. 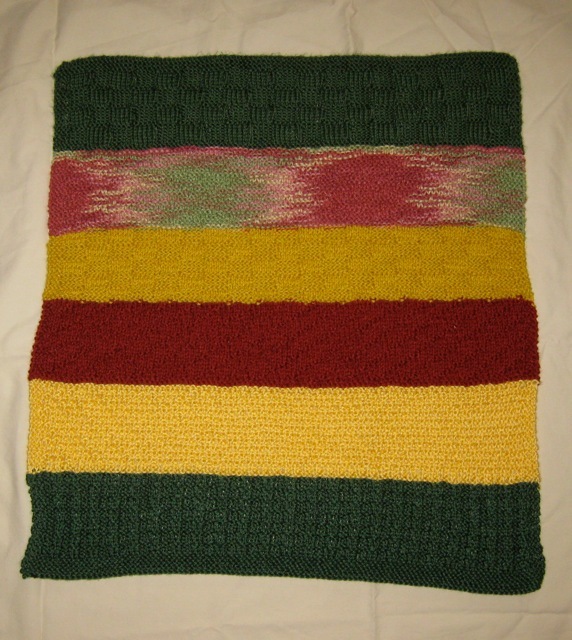 I ordered by cases from Jimmy Beans Wool, but a local yarn shop or any online supplier may also have them in stock. I was not paid to put the above links in this post, I am simply a satisfied customer. 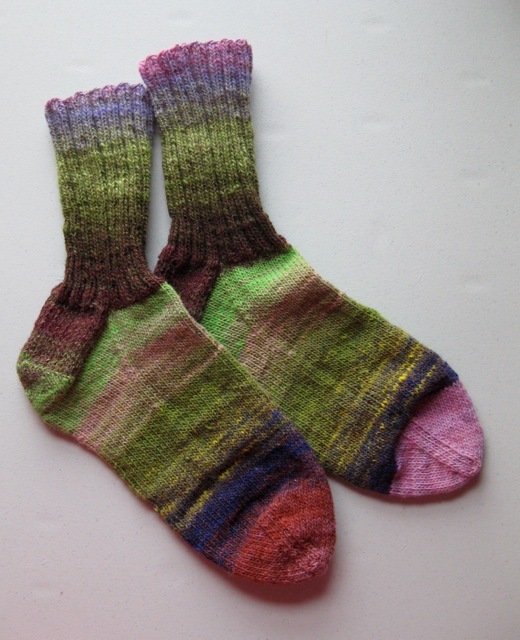 Finished on Monday and knit on size 2 circulars with Noro sock yarn, this will be the last pair of socks in 2010. I usually like the way Noro stripes, but this skein didn't look like it contained so much green. I probably will not purchase another skein of Noro sock yarn: in places it was thick and not plied; others, thin and nearly a thread. Since this yarn does not contain superwash wool, the socks will need to be washed by hand. Update - March 5, 2011 - I decided to launder this pair with my other wool socks in a mesh bag in the regular wash. (I always air-dry my hand-knit socks on a laundry rack). These socks felted a bit in the wash but not enough to affect the overall fit. I've washed them this way three or four times without a problem. I like to find objects that others overlook or ignore. 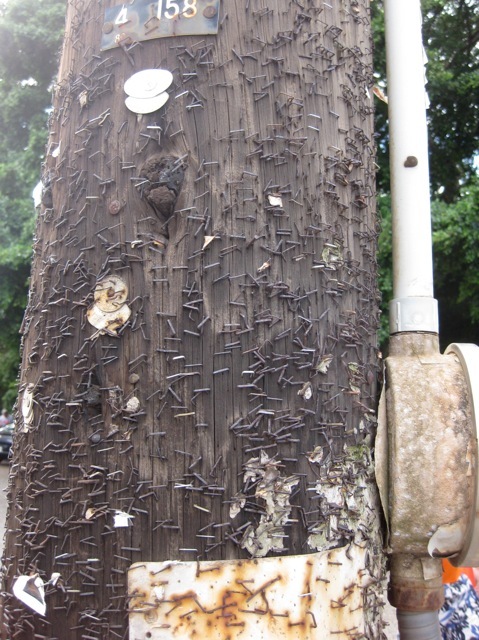 It was obvious that over the years, people have used this pole to tack posters of events, sales, and notices, but I could not believe how many staples were on the surface of this pole, literally hundreds and perhaps even thousands. 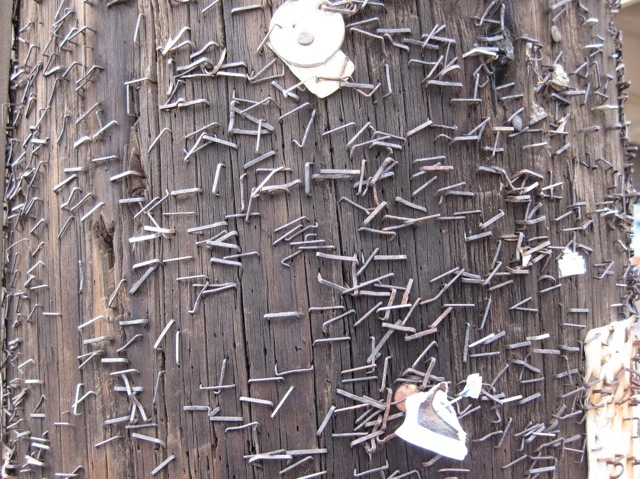 The staples were visible nearly seven foot high and as low as 24 inches from the ground. I challenge anyone to find a pole with more staples than this one. 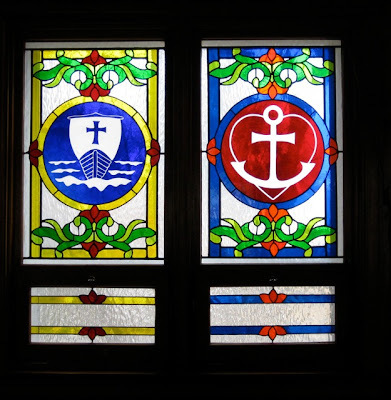 I've admired the windows in my church for years and decided to share them with my readers on Sunday. 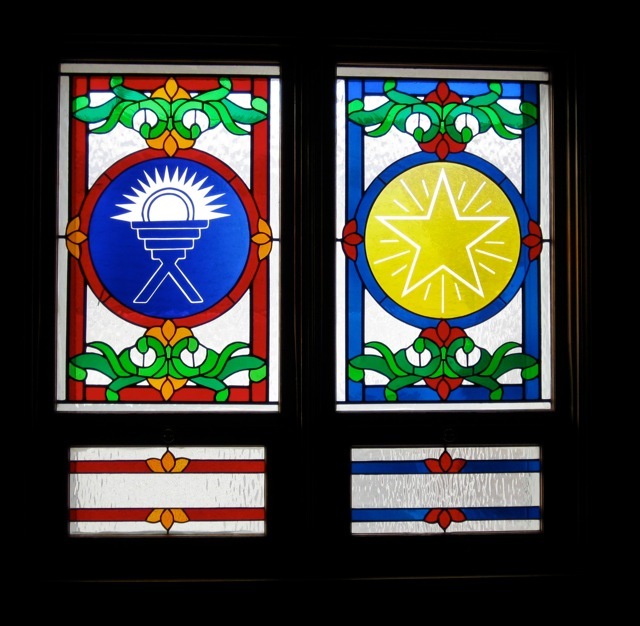 So beginning today and for the next twelve Sundays I will feature two stained-glass windows along with an explanation of each window. The Manger is symbolic of the birth of the Lord Jesus Christ, our Lord and Savior. 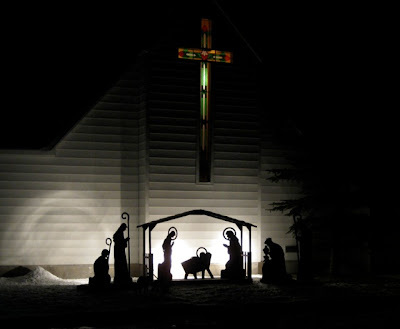 This popular and well-known symbol reminds us of the first coming of the Lord Jesus as the Prince of Peace, born as a baby and laid in the manger at Bethlehem. 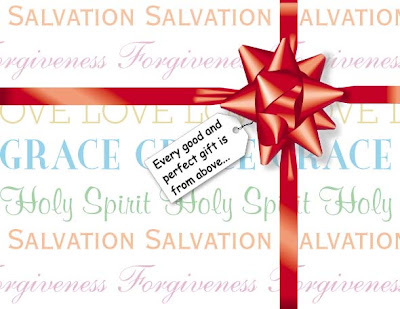 So when we see this symbol, we look forward to Christmas the celebration of the birthday of Jesus Christ. The five-pointed star with rays emanating from it is known as "the Star of Epiphany," meaning "manifestation or showing" - the showing or manifestation of the Child Jesus to the Gentiles, represented by the "wise men from the East," who sought the royal infant of David's line because they had observed the star but did not know the exact place of birth. Robert Edgren High School was a jumble of buildings in 1979 - 80. The main building was an old hospital with a classroom addition. It was like a rabbit warren with many hallways and twists and turns. 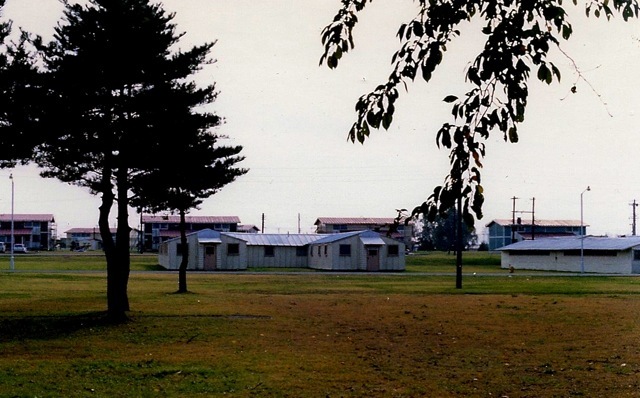 My classroom was located in one of three adjacent buildings, which were old barracks. These buildings were shaped like an "H" and my classroom was the lower right leg of the "H" in this photo. 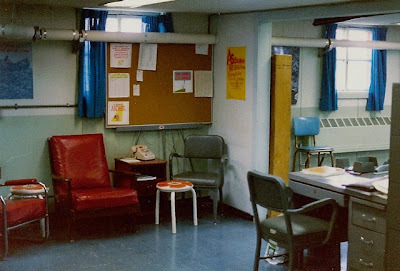 The school nurse's office was in the upper right leg; another English teacher, the lower left leg; an office and storage, the upper left leg. The connecting section was where the bathrooms were located, complete with showers. It was definitely a unique classroom. 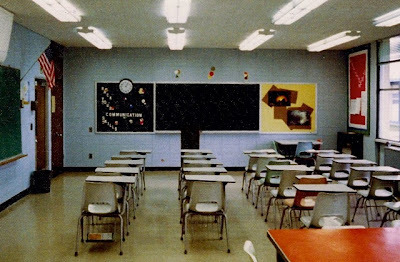 The ceiling was so low in the classroom, I could touch it without stretching. The other end of the room housed my desk and a work area. I was blessed to have a telephone, but it was restricted to base calls. On Thanksgiving (Mountain Time), my family called me on this phone. It was early, Friday morning in Japan, but I did not mind waking up early. 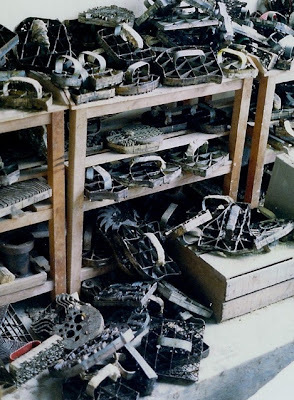 We did not talk long because overseas calls were very expensive 30 years ago. 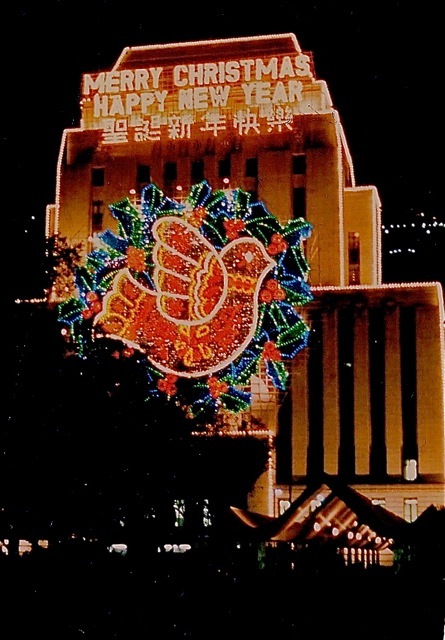 That year, most of my family celebrated the holiday at my sister's house in Denver, so I think I spoke to everyone but my brothers. The walkway from the main building to these outer buildings always steamed in the winter, but I never found out why. Students walked through the billowing mist to and from class. The building was either too hot or too cold - never a happy medium. 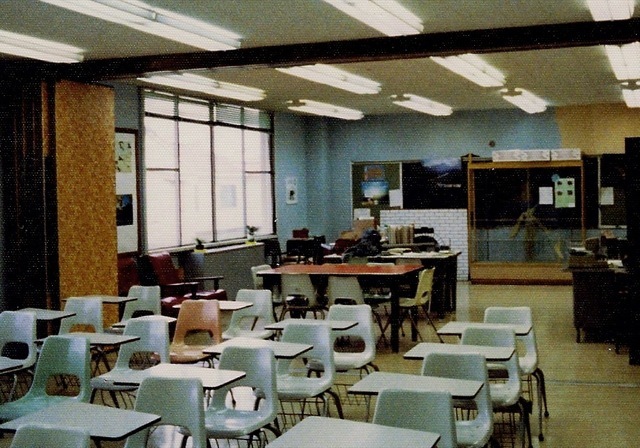 The next year, my classroom was moved into the newer section of the main school building. This wing was more modern, had much better lighting, a wall of windows, and heat that could be regulated. My area was actually two rooms in one. 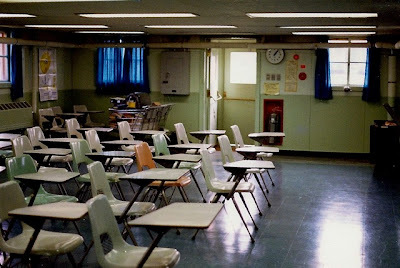 Another teacher used my room during my planning period, so the folding doors were closed during that time. A entire new school was built several years after I left Misawa Air Force Base. Some of the faithful arrive early to hear Christmas carols played by children on the piano in front of the church. The knotty pine walls create a warm glow throughout the chapel. 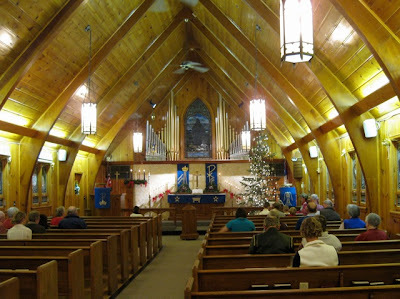 Notice the pipes for the organ around the front window. The organ is almost too much for this church, but it helps the talented organists bring the hymns to life. The youth group find a nice tree in the mountains for the church and members who purchase permits. Chrismons on the tree were made several years ago by a the Lutheran Woman's Missionary League (LWML) members. The symbols were traced on styrofoam and decorated with sequins and gold glitter. Similar patterns are available online. 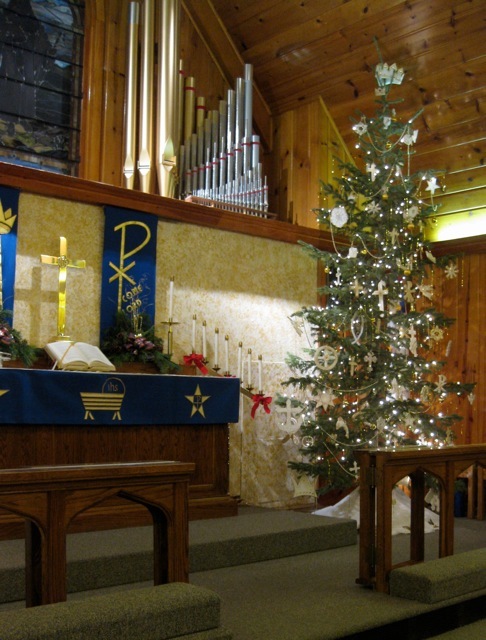 On Christmas Eve, at the end of the service, the church lights are turned off and only the tree and altar candles remain lit. Then, the ushers work their way down the aisle lighting candles of those on the end of the pews. 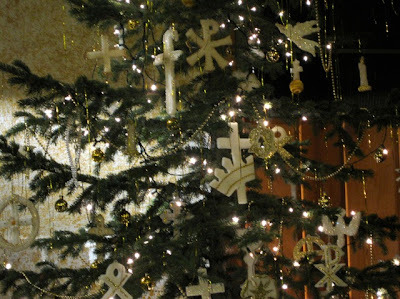 Slowly, the flame is passed from person to person and the church is filled with candlelight, the shimmering tree, and the familiar words of Silent Night. It never ceases to cause my eyes to tear and a lump to form in my throat. 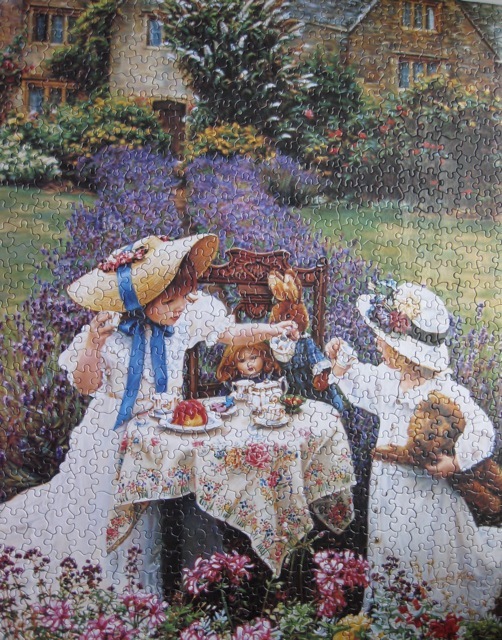 Marilyn gave me a puzzle last Christmas, and I finally got around to putting it together. 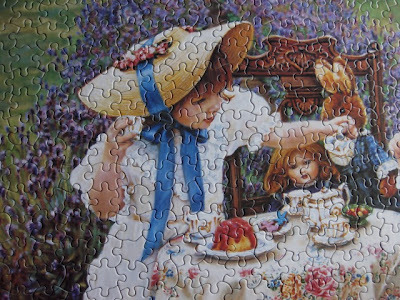 It was a delight to see the tea party fall into place. Thanks, Marilyn. On a side note: Yesterday, Alycia posted a photo of In the Wind on her blog, Alycia Quilts. Seeing it again nudges at my heart to work on another Quilt of Valor.